Shop till you drop at Quartier Petit Champlain and Sculpteur Flamand. Your cultural itinerary includes sights like Old Quebec and Battlefields Park (Parc des Champs-de-Bataille). Step out of Quebec City with an excursion to Moulin la Lorraine in Lac Etchemin--about 1h 25 min away. Next up on the itinerary: take an in-depth tour of La Citadelle de Quebec, stroll around Parc de la Chute-Montmorency, take in the spiritual surroundings of Basilique Cathedrale - Notre-Dame-de-Quebec, and take in the exciting artwork at Galerie d'art Factory. 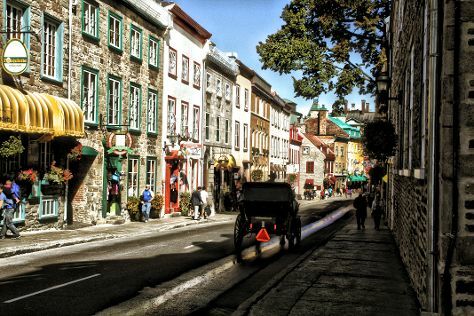 To find ratings, more things to do, where to stay, and other tourist information, use the Quebec City day trip planning website . The Route module shows you all the different ways you can get to Quebec City. Expect a daytime high around 19°C in May, and nighttime lows around 9°C. Wrap up your sightseeing on the 24th (Fri) to allow time to drive to Montreal. Your inner history buff will appreciate Notre-Dame Basilica and Saint Joseph's Oratory of Mount Royal. For shopping fun, head to Jean-Talon Market or Galerie Mp Tresart. You'll find plenty of places to visit near Montreal: Val David (Lolipop & Boutique Galerie Kinya Ishikawa), Maison Trestler (in Vaudreuil-Dorion) and Paroisse Saint-Sauveur (in Saint Sauveur des Monts). There's still lots to do: explore the world behind art at Musee des beaux-arts de Montreal, make a trip to Old Montreal, learn about winemaking at Vignoble Kobloth & Microbrasserie Ross Stall, and take an in-depth tour of Pointe-a-Calliere Museum. For ratings, other places to visit, reviews, and more tourist information, read Montreal trip builder app . Getting from Quebec City to Montreal by car takes about 3 hours. Other options: take a bus; or take a train. When traveling from Quebec City in May, plan for a bit warmer days and about the same nights in Montreal: temperatures range from 23°C by day to 11°C at night. Wrap up your sightseeing on the 6th (Thu) to allow time to travel to Toronto. Casa Loma and Hockey Hall of Fame are good opportunities to explore the local culture. Museum-lovers will appreciate Royal Ontario Museum and Fort York National Historic Site. Venture out of the city with trips to Joyride 150 (in Markham), Love Nest Studios (in Bloomfield) and Port Hope (Art Gallery of Northumberland - Port Hope, Art Emporium by the River, & more). Next up on the itinerary: hunt for treasures at St. Lawrence Market, appreciate the extensive heritage of The Distillery District, admire the masterpieces at McMichael Canadian Art Collection, and view the masterpieces at Eskimo Art Gallery. For maps, traveler tips, where to stay, and tourist information, refer to the Toronto trip planner . Fly from Montreal to Toronto in 3.5 hours. Alternatively, you can do a combination of flight and bus; or drive. Expect a daytime high around 27°C in June, and nighttime lows around 17°C. Finish up your sightseeing early on the 20th (Thu) so you can travel back home.